The responsibilities of a dog owner are numerous. We’re in charge of feeding them, taking care of any medical needs, getting them plenty of exercise and otherwise ensuring their health and happiness. Exercise is possibly one of the biggest responsibilities, and plays an essential part in your dog’s health and happiness. Unfortunately, about one in five owners do not take their dog out for regular walks. And while most dogs are more than happy to sleep and be lazy most of the day, they still need activity to ensure their health. 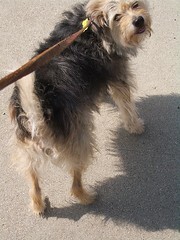 Experts recommend that the average dog needs a walk of about thirty to forty minutes every day to maintain their health. This keeps them fit and stimulates their mind. And without stimulation, dogs tend to become bored. This boredom and depression can result in them wreaking havoc in the house. So for those owners that do take their dogs on regular walks, you not only keep your dog healthy, you may actually be saving your home from the antics of an anxious dog. When depressed or bored, dogs tend to chew or seek out activities to occupy their mind. Additionally, dogs that get regular exercise are more responsive to their owner’s commands and teachings. When working with a dog during housebreaking lessons, this can prove to be an extremely effective method to keeping them calm and focused when it matters most. There is also the overweight situation which has resulted because of the lack of exercise. This has led to early and uncomfortable deaths among dogs due to the lack of healthy activity in their life. For those owners that regularly walk their dogs, the result is that they can enjoy a long life with their dogs. They have more fun and the experience is far more memorable, which is the greatest reward. One thing that many owners don’t realize is that walking their dog is healthy for you too! The regular exercise gives you the opportunity to strengthen your body and mind while bonding with your pet. During a walk, the experience has had astounding results when it comes to developing a bond between owner and dog. Dogs that are regularly walked tend to respond better to their owner and interact more intelligently. Responsible dog owners that regularly walk their dogs are in essence very smart. With all the benefits that your dog receives and all the problems this prevents, it’s a wonder why every owner doesn’t participate in this practice. And be assured, your dog will definitely thank you later. « Is the Pet Patio Potty Right for My Dog?